The Hopkins Center for the Arts (left) and The Hanover Inn Dartmouth (right) face the Hanover Green. Every classic New England town has its traditional elements: Main Street, a central church, the village green. In Hanover, New Hampshire, Main Street happens to be part of the Appalachian Trail. 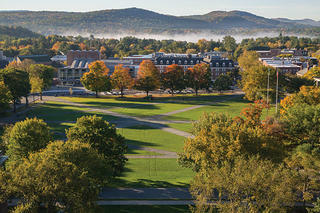 The Hanover Green is the centerpiece of ivy-covered Dartmouth College. And Rollins Chapel, the town’s most prominent place of worship, was designed by distinguished architect John Lyman Faxon, a disciple of the great H.H. Richardson. Hanover’s mix of town and gown makes it a logical jumping-off point for a weekend of fall leaf-peeping in the surrounding Upper Valley of New Hampshire and Vermont. 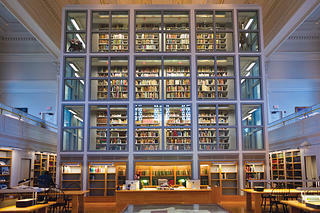 Bookish types can enjoy a 4 p.m. tea for 10 cents in Dartmouth’s wood-paneled Sanborn Library. The school’s Hood Museum of Art and Hopkins Center for the Arts provide plenty of cultural fodder, and the Connecticut River offers ample fishing and boating opportunities. Preservation talked with three local experts about their favorite places to eat, stay, and visit in the Hanover area: Marcelo Gleiser, a theoretical physicist and author who teaches at Dartmouth College; Keith Moskow, founding partner in Boston’s Moskow Linn Architects and a Norwich resident; and Bente Torjusen, executive director of AVA Gallery and Art Center in Lebanon. EAT: In Lebanon, New Hampshire, Three ­Tomatoes Trattoria has wonderful Italian food and a big wood-fired oven. Of course, the restaurant at Simon Pearce in Quechee, Vermont, is wonderful, and next door is the Parker House Inn & Bistro, which is also good. If you go to the new Northern Stage theater in White River Junction, Vermont, eat at the Tuckerbox, which serves Middle Eastern cuisine. STAY: The Norwich Inn is a lovely place to stay. And the Great Stone Dwelling at the Enfield Shaker Museum in Enfield, New Hampshire—you can stay overnight there. It’s on Mascoma Lake, 15 to 20 minutes from Hanover. DO: Saint-Gaudens National Historic Site in Cornish, New Hampshire, is open Memorial Day through October. It is the residence and studio of the sculptor Augustus Saint-Gaudens, and they also have a separate gallery space for changing exhibitions. It’s right by the Connecticut River and has a great view. 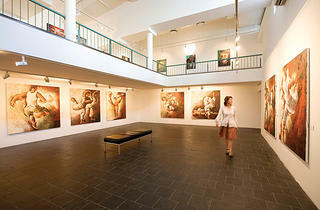 To explore our AVA Gallery and Art Center in the former H.W. Carter & Sons overalls factory building is a lot of fun because we have combined remnants from the past with contemporary art. We have gallery space, studios, and a sculpture garden that’s gorgeous in the fall. EAT: Carpenter & Main in Norwich, Vermont, is a good value and has really good, local food. Isabell’s Café in East Thetford is a tiny little establishment that’s only open for breakfast and lunch. It feels like Vermont’s equivalent of Cheers, only for a breakfast place as opposed to a bar. Everybody’s friendly. It’s the same stuff you cook at home but you don’t have to cook it yourself. STAY: Hotel Coolidge in White River Junction. The railroad is right across the street—it’s very old-school. The owners live nearby and are very involved. It’s a cool little part of town. White River Junction has seen a renaissance of sorts. DO: Dan & Whit’s General Store in Norwich. You can buy everything there; it just keeps going and going. Rauner Special Collections Library on the Dartmouth campus is a renovated historic building and the inside is so tastefully done, mixing old and new. It puts the books right on display. Union Village Dam on the Ompompanoosuc River in Thetford is an enormous dam. I’ve fly-fished right by there, but I’ve never caught anything. In some parts of the river, you feel like you’re in Montana. EAT: My two favorite places right now are a new tapas bar here in Hanover, Candela Tapas Lounge, and Elixir in White River Junction. In Elixir you feel like you’re in Greenwich Village. It’s very nice and always packed. STAY: Of course the typical place to stay is The Hanover Inn Dartmouth [a Historic Hotel of America]. The Quechee Inn at Marshland Farm is also very beautiful. Woodstock, Vermont, is such a well-preserved New England town, including The Woodstock Inn & Resort, which is spectacular. The ­Trumbull House Bed & Breakfast in Hanover is very cute and an off-the-beaten-track kind of place. DO: Visitors should definitely hike the Appalachian Trail portion in this area. You can start right in Hanover, and if you are adventurous you can go all the way to Lyme. Another staple is Quechee Gorge—it’s beautiful. 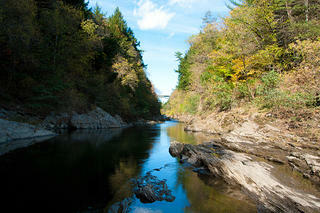 You can take a footpath all the way down the gorge, where there is a beautiful natural pool at the bottom. The José Clemente ­Orozco murals [in the basement of Baker-Berry Library] are such a hidden gem on the Dartmouth campus. Then there are all the old cemeteries you can drive around and find. There’s one in Hanover, the Dartmouth Cemetery, with graves from the late 1700s.